Welcome to my website. Please let me know if I can help you in any way. I am here to help make your gifts "Personal"! 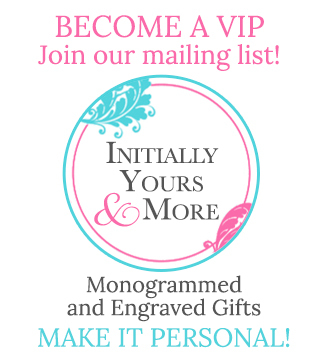 Hi I'm Jolene McCall, owner of INITIALLY YOURS AND MORE and my goal is to give to everyone the opportunity to afford personalized boutique type items and monogrammed items at the BEST price available to you! If it can be monogrammed or personalized I can do it! Initially Yours and More is a company I created with you the consumer in mind. I personally like deals and discounts and wanted to extend what I could to all of you offering you the best price guarantee on any of the products I sell! I set the company up to do home parties, shows and catalog parties as I love people and meeting new people and this is a great way to do that! Call and book a party and make it a fun GIRLS NIGHT at your house or a catalog party if your not local to SC. Take a catalog to your work/office and just have a book party collect orders and get the hostess benefits also by just doing a catalog party. I also do a lot of School/Church Fundraisers so if your school would like to raise money for their PTA or an event please call me at 864-680-9562. I can personalize your fundraiser to suit any of yours needs anywhere in the USA. I also ship anywhere in the USA so order from anywhere. We have done CHEER bags for the Dorman Cavaliers for their state competition! GO CAVS as well a lot with BSHS and other local schools and out of state as well. Email us and we will personalize and price for your specific needs on a quantity order and give you the best price possible! We have done fundraisers for individuals as well for "Relay for Life" and a "Breast Cancer survivor" Email me or call and I'll help you make your fundraiser raise as much as we can for your cause! School Festivals or Events... call us we will be there with a display and take orders or have items available with us to buy whichever works best for your school or event. WANT TO BE ADDED TO MY EMAIL LIST TO RECEIVE DISCOUNTS AND EMAIL NOTIFICATIONS OF NEW PRODUCTS? JUST SEND ME AN EMAIL AND I'LL ADD YOU TO THE SPECIALS AND DEALS EMAIL LIST! and click LIKE to be notified of specials and new products and catalogs. and I will send you an invoice to pay through online or take a payment by phone as well! THANK YOU AND BE SURE TO BOOKMARK MY WEB SITE! Call me if you are interested in a fundraiser and we can discuss details. If your school needs catalogs to do a school fundraiser I have plenty! Call about fundraising for your school or organization! Corporate Gift Ideas! Call me I will specialize it to fit you needs and give you great discount pricing. I have a large stock of items and inventory and can fill any size order! I want to ensure my customers are happy with their order so please notify me if you are not as that is the essence of a successful business these days the one who is most important to help make it a success YOU! Please feel free to share you positive comments with me as I love to post them on here and really appreciate it! Thanks so very much for helping make my Company a success!